Our first CSA (Community Supported Agriculture) box went out last Thursday to our members in Pemberton and Whistler. 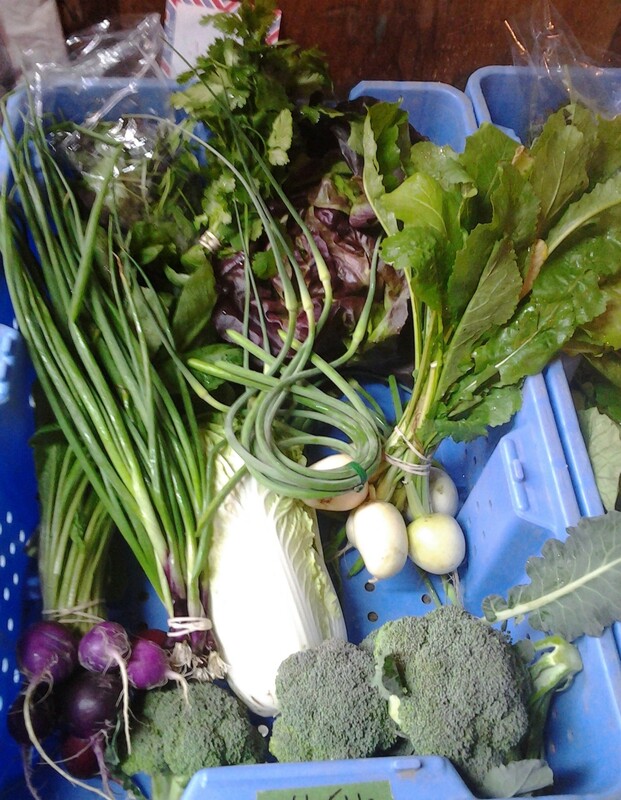 Even though it’s still early in the season, the box was packed full of great veggies, including broccoli, Napa cabbage, green onions, garlic scapes, radishes, lettuce, cilantro and Hakurei salad turnips. Some of these veggies are pretty familiar, but others might be new for members and others buying these items from the market, so here are a few ideas to using them. These are the tender tops of the garlic plant, and can be used the same way you would use garlic, or sautéed with butter. A great use for them is to blend with fresh basil, olive oil, and a nut like pine nuts or peanuts. These mild-tasting turnips are great in salads and sandwiches, or brushed with salt, pepper and olive oil and grilled. If you like your greens, you can sautée the turnip greens with butter and garlic. For more information on Rootdown’s CSA program, see here.